On July 9, 2016, we had a wonderful evening celebrating Eid Mubarak with all the members left here in Chambana at AACC. The evening started with the dinner fest full of ‘Raya Food’ brought by the members. There were Rendang, Ayam Kapitan, Laksa Sarawak, and many more! Not to forget, there were also tenth of choices of ‘Kuih Raya’, which some of them were home-baked by the members who came. We had so much fun catching up with each other after a long time since last semester. There were a lot of stories to tell and so many things to share. Once the sun was starting to set, we gathered outside to play sparkles. 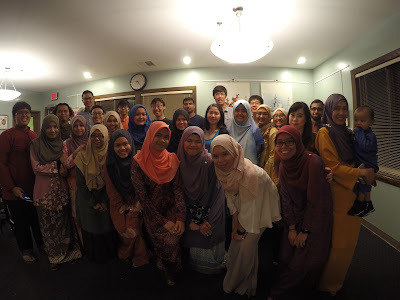 Each of us were given a few sparkles and we started to dance to the Raya songs played out loud on the speaker. The night was so happening with all the laughing, dancing and sparkling lights surrounded us. We did not stop there. The night was continued with karaoke session of our favorite Raya song inside. One after another, Siti Nurhaliza’s after Anuar Zain’s songs were sang by us. There were some sad songs and there were some happy songs being sung for the night just to celebrate the wonderful Eid Mubarak. Times were running fast and the night was getting late. We ended our celebration with a group photo. The photo was so colorful with the bright and beautiful colors of our members’ “baju raya”. We said our apologies and gave our forgiveness to each other and walked out to go back to our own house. We hope we will meet again next time to celebrate Eid Mubarak together. This entry was posted on Saturday, July 09, 2016 and is filed under 2016,Aidilfitri 2016,Summer 2016. You can follow any responses to this entry through the RSS 2.0. You can leave a response. Being here in Pakistan it is so good to hear about such events. I hope you enjoy your next Eid also and have loads of fun with all your friends and family. This is a great venue. I was here for a party and there was so much food and it was all done so well! The decor and food both were amazing. Personally, I think the space at the event space is laid out really well and the size of the venue keeps pulling great parties. Click to Visit our Flickr! Check out other videos from other universities here!